When it comes to folding chairs, National Public Seating’s specifications have become the barometer by which all other’s are measured. Our basic Series #50 features a 19-gauge frame, double riveted “U” brace for leg support, and is available in four popular color choices. The Series #200 and #300 are all built on an award winning 18-gauge frame with double riveted “U” braces and our signature square, double-contoured back for ergonomic support and comfort. While the Series #200 offers two hinges and two cross braces, the #300 features two hinges and three cross braces. 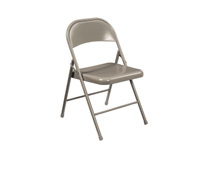 1¼-inch padded chairs in both vinyl and fabric are built on both the #200 and #300 frames, creating the #1200, #1300, #2200 and #2300 Series, plus the #3200 Series; a two-inch seat popular in the worship market, which is available with a textured painted frame and four designer fabric choices. #3200 series is now available in vinyl padding, by popular demand. 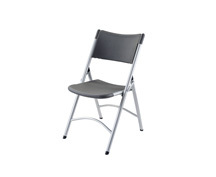 Also part of this line is our best-seller; the #800 Premium Lightweight Plastic Folding Chair. 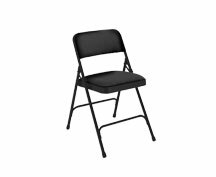 Built on the #200 Series frame, but with a lightweight polypropylene seat & back, this stackable folding chair offers the best of both worlds. 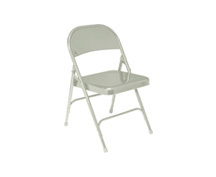 Available in five color choices, it is simply the best selling institutional folding chair on earth. Recently introduced, is the #1100 Polyfold Series with the #800 frame & seat/back, but also with a fanback for comfort and ergonomics. Both these chairs are complemented with special dollies for stacking purposes. Most of the chairs in this section have been laboratory tested to hold a 480lb. weight capacity! 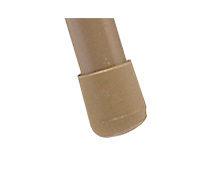 Look for the BodyBuilder Logo near the product.